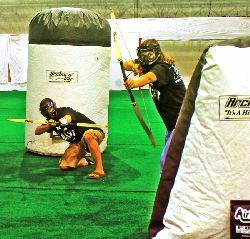 This fast-paced, archery game blends dodge ball and target shooting into a thrilling team competition. Using approved foam-tipped arrows, players can shoot the other team or aim at targets to win the game. Excellent for team events! Up to 6 players per team. Includes referee to manage the match. Note: Add on the SAFE Archery rental to give players practice time or non-players a chance to shoot the arrows.